Oh, Tuesday. You flaming piece of hot garbage. Overnight, we travelled one step closer to the rail strike, Kylie Jenner got the internet surmising and Jennifer Lawrence was unjustly negged. Discussions between Government and union breakdown, rail strike going ahead. 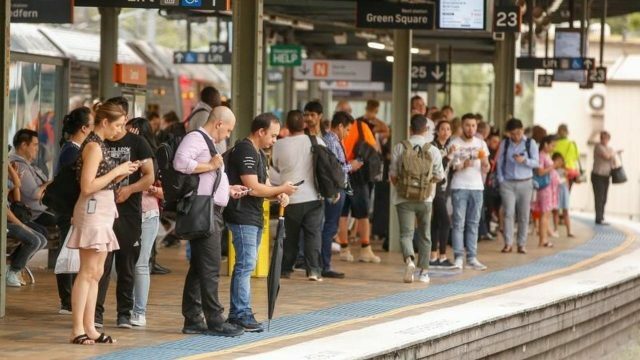 Prior to the weekend, Unions NSW secretary Mark Morey said both the unions and the Government hoped to bash out a more attractive package to expose to workers this week, but we’re clearly not there yet. The planned strike would begin the seconds after midnight on January 29. Kylie Jenner hides stomach, exposes a long-held secret. The great thing about over-analysing a photo on the Internet is that it can be blown up to justify literally anything. For example, Overnight, Kylie Jenner has decided to cover her stomach in a family underwear photo shoot for Calvin Klein. But why? What it means is obvious, stupid. Jenner is clearly hiding something. But what? Well, it’s obvious isn’t it? Hidden under that blanket is a worn, tattered scroll, carved by the Freemasons in 1912, totes bragging about their sinking of the Titanic, and their subsequent fudging of the inquiry. Whoa. This changes everything. I understand now. The scroll passed to Kylie from her Dad, who in turn received it from Uncle OJ, who received it from persons unknown. Perhaps he wanted to spill the secret, so he himself became the iceberg, creating that court case because he knew that it would sink the bloated vessel of American culture. But all they could see was the body count, not the iceberg itself. Offensive Line Star – Near, Far, Wherever you are. Oh, JLaw. I’m sure you care not for the whims of haters, and their propensity to live the actions of their name, but nevertheless, congratulations on your upcoming Razzie nomination. However, if you’re reading, and I can only assume that you are, know that criticism is a dying industry. The public’s desire for objective fact, or established knocking of stars is in a deep recession. Frankly, we’d rather do it ourselves. Regarding that chintzy award show, I suggest you attend. Visit it as you would Venice. Enjoy those streets before they fall into the sea forever. Remember, if fetid juvenile criticism is what you desire, we’ll always have Twitter.